Interstate Avenue, the evening of December 2, 1964; the neon lights were on but the cars were gone. Earlier that afternoon, the Minnesota Freeway opened. Traffic raced through North Portland in a trench, three blocks west of the Highway 99W surface route. At service stations, restaurants and motels along "the Avenue," implications were setting in. The era of interstate travel on Interstate Avenue was over. Three quarters of a century earlier, in the logged over patchwork of woodlots, dairies and small farms on the Peninsula, two roads, Myrtle Street and Maple Street were platted parallel to each other in the North Albina Addition. The new subdivision, near the station stops of Ockley Green and Arbor Lodge on the steam rail line to St. Johns, was one of many staked out in the area, soon to be annexed by the city of Albina. "Street scene on the Peninsula, Portland Oregon" circa 1900. The cities of Albina and East Portland were consolidated into Portland in 1891. The following year Myrtle Street was renamed Patton Avenue and Maple renamed Maryland (portions of both would be combined to make Interstate). Neighboring Oak was changed to Montana, Cedar to Minnesota and Hemlock to Michigan. The changes were made either to conform with other street names in the area, as in the case with Patton, or to remove duplication (in Albina alone there were other Myrtle and Cedar streets). At the same time, area residents began to advocate for a road west of Mississippi Avenue to reach down the bluff towards Lower Albina and downtown Portland. "Interstate Avenue? Wasn't such a thing when I was a boy. Where Interstate is now there was nothing but a wide stretch and a few houses, a fire station and a wooden schoolhouse. We called it Patton Avenue. It didn't deserve any name at all. That street had the biggest damn hoes in it you ever saw. You could go swimming in them." -Clifford Nelson in the Oregon Journal, October 24 1977. 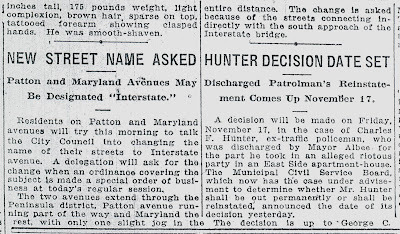 The desire for a new road south likely influenced a local movement to combine the north end of Patton with the south end of Maryland to form Interstate Avenue, with the goal of connecting downtown to the new Interstate Bridge. The south end of Patton was to be renamed Massachusetts, adding another M state name to the area. The motion was passed by the city council on December 16 1916. 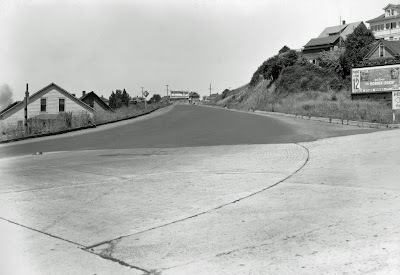 Despite grand arterial aspirations, "the Avenue" was still a local street that stopped at the edge of the bluff that overlooked Lower Albina. In 1923 a new effort was mounted by the Greater Peninsula Association to cut a grade down the hillside. The cost would be split by the city, county and local property owners. In 1928 the grading was complete. Shortly thereafter Interstate was extended again by renaming Delay and Larabee south to the junction with Broadway. 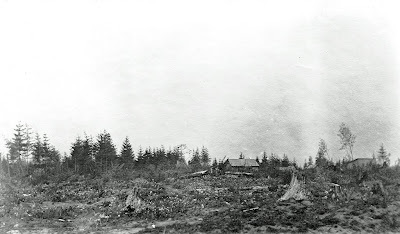 The extension to Lower Albina in 1930. The partially visible sign to the far right likely advertises the Interstate Auto Camp on Columbia Blvd. -City of Portland Archives. As part of West Side Pacific Highway #3 (designated US 99W in 1930) Interstate Avenue began to take on the accoutrements of a highway: service stations, auto camps and billboards. In 1939, Interstate lit up. 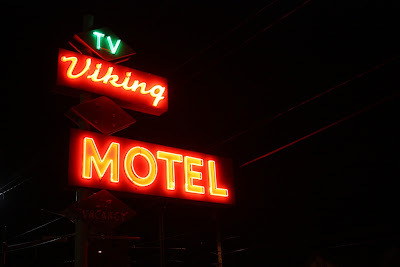 "For seekers of new beauty in Portland, a drive at night on Interstate Avenue has possibilities. The simple symmetry, the sweeping curves, the new overhead lights, caused a child to say, "Its like on the way to fairyland." One gets the first glimpse of this novel charm, from the city side, after passing the junction with Greeley Avenue and starting up the hill. From here on Interstate is different. That's because the lights hang higher than the conventional, and shaded and uniform in the distance. Up the hill and around the first curve, the beauty unfolds. Great numbers of lights, so accurately spaced, are individually visible. The street is remarkably free of signs and illuminated business places. The street lamps are shaded so they pour their soft brightness on the pavement. Houses are left in shadow. One is aware only of light - a path of light through the darkness. Ingenious little devices, like the eyes of a night creature, set in the raised portion, one after another scrutinize the passing car and passes it on. Mysterious sentries on watch." -From Beauty in a Street, the Oregonian, December 30 1939. 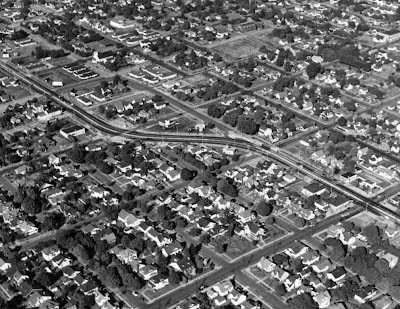 Interstate in the area of Prescott and Failing in 1947. 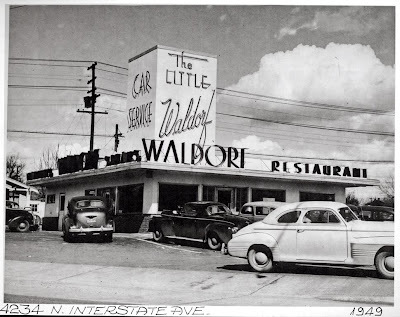 The Little Waldorf drive in and Walt's Associated service station (both pictured below) are visible along the curve where Interstate jogs from the Patton to Maryland alignments. As now, electric powered transit served the area, then in the form of Portland Traction's Interstate trolley bus line. The current I-5 trench cuts through the blocks immediately to the left of the Patton Home (brick building, top, right of center). -City of Portland Archives. (click on images to expand). After the war "the Avenue" glowed with neon. 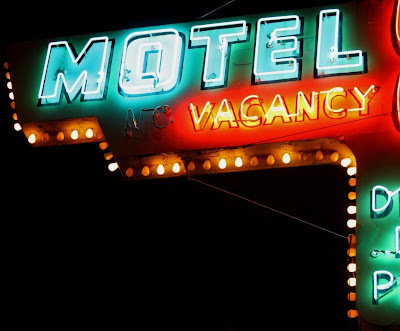 For two decades, restaurant, motel and service stations were lit late into the night, enticing travelers to stop, eat, stay or fill up. Walt's Associated service station on Interstate between Mason and Prescott, and behind it, the Little Waldorf car hop drive in. The building still exists as Interstate Automotive. In 1958 there were twenty three service stations on Interstate between the Broadway Bridge and Kenton. Today there are four. - Photo courtesy of Gary Larson. 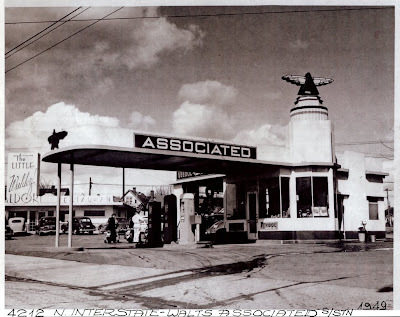 In 1933 there were already thirteen service stations on Interstate. In the postwar years the number reached into the twenties. Stations such as Vern's Signal, Overlook Enco, Interstate Texaco, Interstate Shell, Vic's Veltex and Jenson's Union clustered at major intersections, sometimes one to each corner. Upholstery shops, tire stores, auto painters and the Rocket Ambulance and Towing Service were also located to serve highway traffic. 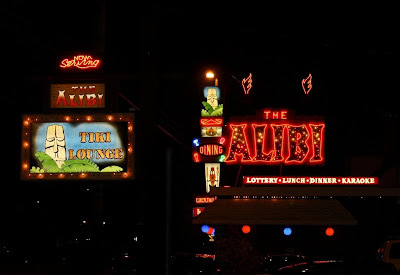 The Alibi, Wongs, the Nite Hawk, Nohlgrens, the Frosty Snack Bar and Howard Finch's Hamburger Palace; restaurants lasted for decades or closed in weeks. 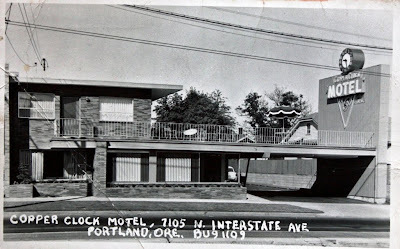 At the Killingsworth intersection during the war years there was the 100 to 1 Restaurant, aka "The Siberian," named for its owner, Si Berry. Will-Yum's In & Out, George's Corner Tavern, the U & I Tavern and Parker's 24 Flavors were favored by both locals and travelers. 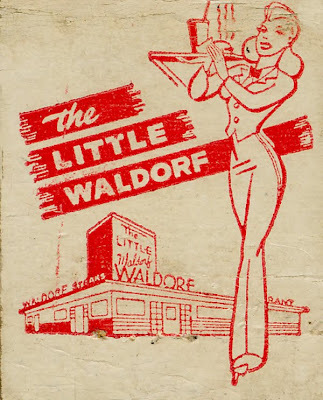 The Little Waldorf drive-in, circa 1949. Much remodeled, today the building houses the Interstate Bar and Grill. The house in the background, on the ill-fated block recently cleared for now absent development, was used as a practice burn for the Portland Fire Department in September. -Photo courtesy of Gary Larson. 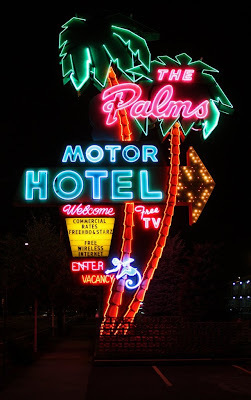 The Palms, the Sands, the Westerner, the Viking and the Crown; Motel signs on Interstate glowed and flashed with Vegas inspired intensity. Some, like Mel's Motor Inn had their own restaurants attached. Swimming pools were de riguer despite a short season. Throughout the two postwar decades their numbers held consistently around fifteen. A postcard from the Copper Clock Motel. On the back: "Dear Mom, we found a nice motel and are having a good time" wrote Larry to his mother in Heppner Oregon on July 3 1959. 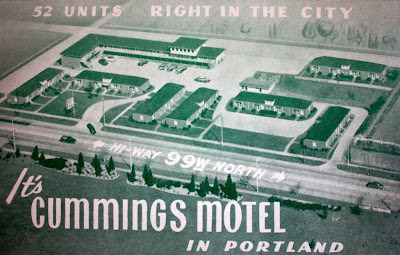 The Cummings Motel was directly in front of Overlook Park on the site of today's Kaiser Interstate complex. 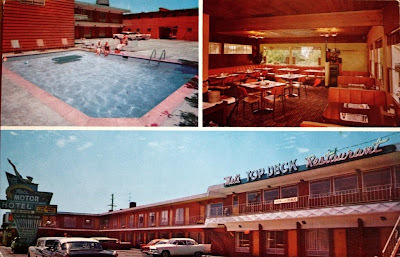 Mel's Motor Hotel, with its Jantzen inspired sign, a swimming pool and Mel's Top Deck Restaurant. 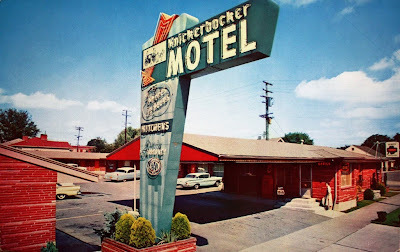 The Knickerbocker Motel at Interstate and Wygant. 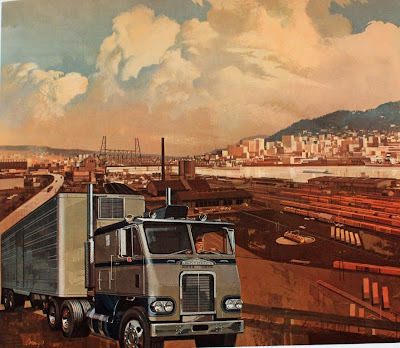 A Frieghtliner truck climbs the bluff above Union Pacific's Albina Yard on an idealized Interstate Avenue in the early 1960s. The Fremont Bridge is still a decade away. -From Oregon - Bright Land of Promise by the First National Bank of Oregon. 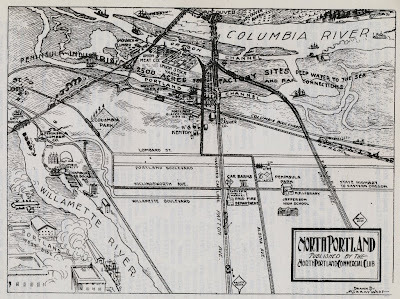 On March 17 1959 Portland's City Planning Commission agreed with the Oregon State Highway Department to route the new federally funded "Interstate Freeway" on a Minnesota Avenue alignment, in a trench through North Portland. When work was completed and the new "Minnesota Freeway" freeway opened on December 2 1964, traffic on Interstate dropped immediately, heralding a long period of decline. "It is too early to determine just what effect reduced traffic volumes will have on Interstate Avenue business establishments, however a number of vacancies have occurred in gas stations and some motels are converting to apartment hotels." -Urban Renewal Minnesota Study, Portland Planning Bureau, 1964. "I remember how quiet it got that afternoon when the last link of the freeway was opened. This was the main line to Seattle. All of a sudden there were no trucks going by." -George LaDu, What ever happened to Interstate Avenue?, the Oregonian, May 20 1984. 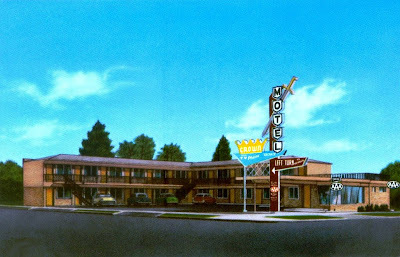 King Arthur meets the Jet Age at the Crown Motel. Successful preservation of this sign would bode much for the future of Interstate's roadside past. Forty five years after the travelers were diverted; Interstate Avenue is still in flux. Higher density development along the transit corridor holds promise for more life on "the Avenue." New business, markets, restaurants and offices are tangible sings of revitalization. It is likely that interstate traffic will someday return to Interstate in the form of light rail to Vancouver. With revival come challenges. How to meet concerns in long established neighborhoods of being towered over by new infill. How to humanize high density big box mixed use residential units? How to build transit oriented development that is somewhat respectful of an areas scale and character? How to keep and maintain what makes neighborhoods unique through times of transition? Its said people hate their parent's architecture and love their grandparent's. It is probably not coincidental that fifty years is the general threshold for a structure to be included on the National Register of Historic Places. What was once seen as garish, common or disposable can viewed in a generation as evocative, unique and worthy of preservation. So it was with Victorian architecture, then craftsmen bungalows and now the mid-century era. Nearly a decade ago during the planning of Tri Met's Yellow Line, local input was sought for the theme of public art at the Prescott Street stop. 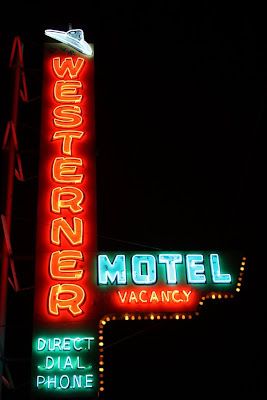 A neon-themed idea to celebrate Interstate's past and play off the surviving motel signs received no official attention. Instead a dead stream motif was chosen and a large ships screw placed across the street from the station. It was too soon to appreciate what was then still considered a sign of blight. 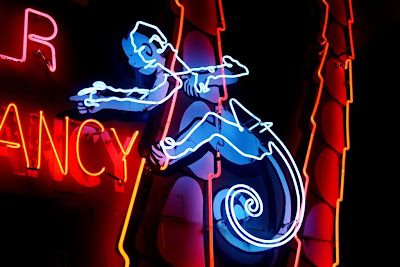 Today neon is part of the design guidelines for the Interstate urban renewal zone, a "neon district" to highlight the area's uniqueness. Will it come to pass, or is it just a sop to drum up support for the Interstate Corridor Urban Renewal planned zoning goals? 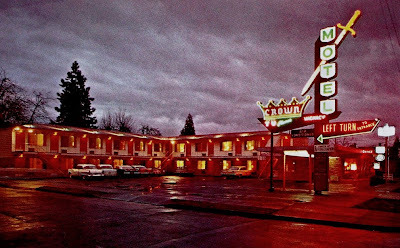 The fate of the Crown Motel sign, presently stored for restoration after the motel was demolished to build Patton Park Apartments, will show how serious Portland is about integrating preservation with transition. Supporters, associated with the Mid Century Modern League, are searching for a site on Interstate. One in particular, enigmatically nicknamed the "pork chop," is a small unused median parcel owned by the Portland Department of Transportation. With the "pork chop" comes a chicken verses egg dilemma: to marshal a plan and resources, the signs advocates need a site. To consider awarding a site, PDOT needs a plan and resources. Could there be a public / private partnership? An inspired piece of solar powered public art? A larger than life community bulletin board? Imagination is not in such short supply as shared initiative and cooperation. 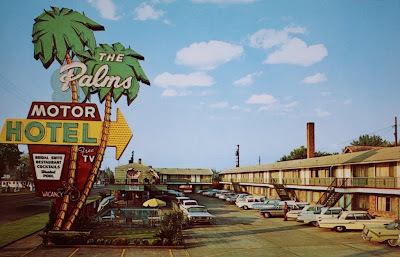 A positive outcome for the Crown Motel sign and the preservation of the other landmarks in the area, from the Palms to Paul Bunyon, will help determine if Interstate will be a vital residential and transit corridor in the next century, or a tree-lined canyon between residential big boxes, with all the historicity of a corporate office park. Success in integrating what makes an area unique with a future that will contain greater population density will have implications, not just for North Portland, but city wide. If done right, "the Avenue" will remain lit for a long time. Brilliant post Dan. So much great history along the avenue. Thanks for the great research Dan! I always suspected that N. Denver was A former route of Pacific Highway, judging from it's sturdy, ancient concrete pavement reaching as far as Killingsworth. We've lived on Montana Ave since 1999, bought our 1890 house from who we understand was the 2nd owner. We found a letter in the attic from 1890, written in pencil, addressed to our home, but on Oak St in Albina, OR! Thanks for the great info. Love North Portland history! This is a great post. I grew up on Church Street, 4 houses west of Interstate. We had great fun walking up Killingsworth, standing on the temporary overpass & watching the heavy dirt haulers going back and forth down in the trench. What a wonderful post! I grew up on Minnesota Avenue until we had to move to make way for the new freeway. Fortunately, we were able to move about 10 blocks east so were still at the same school and church. One thing about all the streets named for "M" states. It helped us learn how to spell Mississippi, Michigan, Minnesota and Missouri long before our classmates. A great chronicle of this area. these are beautiful images. where did you find that pdx vintage map? I live in Overlook, 4 blocks from the Palms. Found your post in a search. Fantastic work on the North Portland history. Makes me want to help preserve some of this stuff even more. My friend and neighbor is storing the Crown sign. I saw it just a couple of weeks ago. It is is good hands. Live at N Killingsworth and N Interstate for six months, a newbie from out of state. Very much enjoy your blog on North Portland. I always felt something stupendous existed here, my hints being the fabulous neon remaining. Thanks for all this great information. This is very nice post Dan! I appreciate you for this good work you have done, keep it up. Great post, Dan. I especially like the Palm's sign at the end. All robot vacuum cleaners utilize tumblr.com/ rechargeable batteries, but the Roomba computer Click the Following Web Page processor utilized innovative technology to offer Quick watch Top Best Essential Oil Diffusers up to percent. Considering you get a Best Child pedestrian pen.io/ and also a jumper in one, it's a very Our Blog affordable item. Go on and get Best Convertible Car Seat Reviews 2016-2017 one from for just.Which is virtually is available. Brilliant post, You research a lot. Thanks for your sharing. It's nice to see more posts from you. Thank you for sharing the article!